UFV is celebrating International Education Week from Nov 7–10. International students contribute to the cultural diversity and vibrancy of our campuses, as well as the social and economic well-being of the university and surrounding communities. Several events this week will showcase the special contributions they make. Universities in more than 100 countries celebrate International Education Week (IEW). 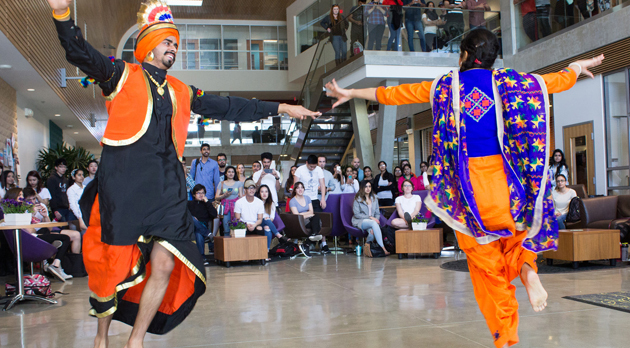 Join us in the SUB Atrium between 11:30 am and 2 pm to watch multicultural performances by UFV International and Canadian students. Get an additional dash of culture by perusing cultural displays and chatting with students from other cultures. In celebration of Culture Day (Nov 3) celebrated in Japan, the Japanese Culture Club, UFV Hip Hop club, and Baker House residence are offering insight into Japanese culture! Come to try out your culinary skills, or just watch and try some new foods! In May 2016, UFV students and faculty travelled to the heart of Sichuan, China, home of the world’s giant pandas. They enjoyed two weeks immersed in the capital city of Chengdu, China, with Visual Arts Professor Shelley Stefan. As part of International Education Week, join us in the Global Lounge on Tues, Nov 8, from 5:30 to 7 pm to see the photo exhibit documenting their adventures and get a mini tour of this southwestern Chinese province. Join us for a one-of-a-kind cooking demonstration and step up your culinary game by learning how to use delicious international ingredients in your cooking.